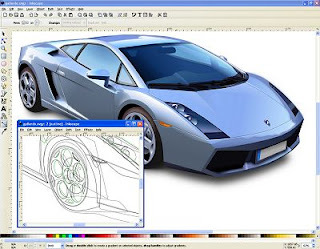 Inkscape è un programma open source per il disegno, simile a Illustrator, Freehand, CorelDraw e Xara X che si basa sul formato standard W3C "Scalable Vector Graphics" (SVG). Tra le caratteristiche supportate da SVG vi sono le forme base, i tracciati, i testi, i segnali, i cloni, le trasparenze, le trasformazioni, i gradienti e i gruppi. Inkscape supporta inoltre i meta-dati Creative Commons, la modifica sui nodi, i livelli, le operazioni complesse sui livelli, i testi su tracciato e la modifica dell'XML SVG. Può importare da diversi formati come EPS, Postscript, JPEG, PNG, BMP e TIFF e esportare in PNG ed in altri formati basati su vettori multipli. Lo scopo principale di Inkscape è quello di fornire alla comunità Open Source uno strumento di disegno che rispetti pienamente gli standard W3C XML, SVG e CSS2. Inoltre il piano di sviluppo prevede una conversione del codice da C/Gtk a C++/Gtkmm, maggiore importanza all'aggiunta di funzioni tramite il meccanismo delle estensioni e la creazione di un processo di sviluppo aperto, collaborativo e orientato alla comunità. The path changing modes of the new Tweak tool allow you to push, shrink, grow, attract, repel, or roughen any path, easily and naturally sculpting exciting freeform shapes. This is a lot more convenient than the Node tool not only because you don't need to think about nodes, but also because it can work on any number of selected paths at the same time. The color changing modes of the new Tweak tool, paint and jitter, are very similar to the way a soft brush works in a bitmap editor. If you have a number of separate objects, you can select them all and paint over them with any fill or stroke color. Inkscape 0.46 comes with a selection of stock patterns, accessible via the Fill and Stroke dialog. It is now much easier and faster than before to fill a path with stripes, checkerboard, or polka dots. The use of effects which previously required to manually installed some Python modules is now straightforward on Mac OS X: they all work out of the box. In addition, Inkscape's interface was made more Mac- friendly by the use of a default theme. This theme reflects the changes made in OS X system preferences (Appearance panel) and works with Graphite (as demonstrated here) or Aqua variants. For advanced users already having a custom ~/.gtkrc-2.0 file, the theme is not enforced and their personal settings are respected. The Paint Bucket tool works just like the Paint Bucket tool in bitmap image editors -- clicking in an area fills the area with the chosen color. Unlike other editors, the Inkscape tool features some additional fill methods to help you finish your work faster. With SVG Filters and Inkscape's new Live Path Effects, the available options and ease of editability to accomplish various visual effects has been greatly enhanced. The picture in this screenshot utilizes a number of features such as Tiled Clones, SVG Filters, Live Path Effects, Clipping and Masking, Multi-stop Gradients and more. This screenshot shows the parameters used on a patch of hair created with the Stitch Sub-Curves Path Effect. Additionally, you can see how handy having docked dialogs is to un-clutter the workspace with the side benefit of increased productivity. To see the full version of this picture you can click here. The Path along Path effect can curve a path along another path. When this effect is applied to path A (called skeleton), another path B (called pattern) can then be passed as a parameter. The result is that path B is bent along path A. With the node edit tool, path A can be editted on-canvas and the result is updated live. This provides a direct equivalent of "vector brushes" or "skeletal strokes" features in other vector editors. This example shows how the new hatching techniques can be used to produce a traditional line engraving from a photo. Note also that thinning/thickening can be used not only for hatchings but for sculpting arbitrary paths - easy shape morphing without the Node tool! Several new features were added to the Calligraphic pen to make Inkscape capable of the ancient art of line engraving. This screenshot demonstrates tracking a guide path to hatch areas quickly and uniformly; tracing background to make your pen width reflect the lightness of the background in every point; and thinning/thickening that lets you change the darkness of your hatchings at any point, or even erase parts of the drawing. Several new modes in the Tweak tool - Move, Move In/Out, Move Jitter, Scale, Rotate, and Duplicate/Delete - make it possible to easily and naturally manipulate any number of separate objects, such as a tiling of clones. With a few soft brush strokes, you can turn a regular tiling into a freeform cloud, "power field," or even a complete drawing as in this example. Inkscape now features Spiro curves (Cornu spirals) introduced to design world by Raph Levien. While FontForge is the first (open source) project that has implementation of Spiro, Inkscape provides a number of features unmatched by other tools, as demonstrated by Andy Fitzsimon. Spiro curves are implemented as a live path effect and can be applied to any existing Bezier path of be drawn from scratch with either Pen or Pencil tool. Per chi vuole avere da subito le nuove funzionalità anche a scapito di un po' di stabilità, o per chi vuole aiutare a testare le nuove parti di codice e identificare i problemi, si può accedere al codice della versione ancora in sviluppo. Fatelo con cognizione del rischio che ciò comporta, e soprattutto inviate segnalazioni se individuate dei bug! Dipendenze Debian - è tutte reperibile nel repository apt unstable. Wikimedia Commons Category, "Created with Inkscape"
VitalBodies Blog: Open Source Inkscape Scalable Vector Graphics SVG Software - Inkscape License Plate, Article and how to install Inkscape in Ubuntu. Ludamillion Ludami's DeviantArt page, yup another one. Everything there (one pic so far) is Inkscaped. Peileppe Production FanArt for Wesnoth, this blog is committed to build a comic (using mainly Inkscape) based on the Battle for Wesnoth's campaign "Heir to the Throne". Articolo interessante ma non ritieni di dover ridurre la lunghezza del post spezzandolo magari con una barra tipo "continua a leggere" ed evitare così di appesantire la lettura dei feed? ?